Widespread innovations have led to technology miniaturization with greater connectedness. The extent of business disruption caused by these phenomena was never seen before. The chief aim of any organization, irrespective of their size, is to provide smarter, highly efficient, and integrated solutions and services to the customers. Everything else revolves around it. Organizations who strive hard to satisfy their customers would never shy away from taking decisive actions. Aligning the organization with the innovations, and leveraging it to become efficient is one such significant decisive action that enables them to stay ahead in the race against competitors. 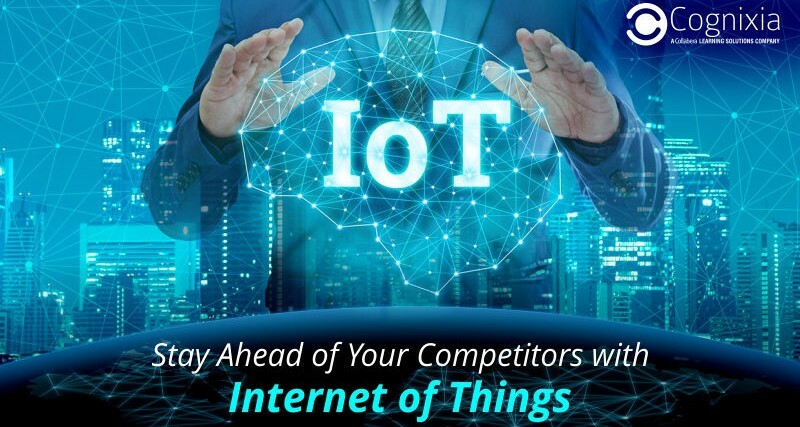 Where, and how does IoT fit into the competitive enterprise realm? The world of science and technology, since the very beginning, has endeavored to build objects and systems with improved efficiency, financial benefits, and lessen the requirement of human effort. In this pursuit, we have reached a phase where computer-based systems have directly integrated the physical world and its behavior. We have electronics, sensors, actuators, software, and connectivity via Internet embedded to a network of physical devices, home appliances, vehicles, and other objects that can connect, collect and, exchange data. This whole assortment of connected things is termed Internet of Things (IoT). In 2017, with 31% year-after-year increase of IoT devices, there were about 8.4 billion IoT devices in the world. It is estimated that by 2020, there will be 30 billion IoT devices. With IoT, the connectivity of internet has surpassed commonly known devices such as desktops and laptops, smartphones, tablets, etc. Internet has now become an integral part of physical devices and everyday objects. These devices are now capable of communicating and interacting over the internet. These devices can be remotely monitored and controlled. Powered by the internet, these devices can interact with one another, and with human beings to get things done quickly, easily, and efficiently. Why is IoT indispensable for your business? By 2020, it is estimated that the global market value of IoT will reach $7.1 trillion. Almost across all sectors, be it healthcare, retail, or logistics, IoT has become a must-have ingredient. An IoT-enabled device having sensors will collect data based on the environment conditions. It will then transmit the data to the service provider who can proactively determine whether a breakdown is anticipated or the device requires maintenance. This breaking down of barriers between physical appliances and human beings can enhance customer experience by leaps and bounds. Protecting the assets, whether human or machine, is one of the most important requisites for an organization. IoT-enabled monitoring helps in determining the events on the shop-floor level and take suitable actions proactively. With smart surveillance; theft, damages, and life-threatening events can be avoided. Real-time data of people, processes, and devices, if leveraged properly, has game-changing implications. Based on real-time insights, businesses make effective decisions right from offering suitable services to accommodating innovation and new business models that achieve the business targets. According to Forrester, IoT will soon become an integral part of B2B value propositions and pricing models. Moving up from the shop-floor, it will provide predictive and proactive maintenance services to ensure better customer experience. In an age where open source philosophy has gained a significant momentum, and there is a rapid demonetization of products and services (the reasonable or free availability of products and services that were once very costly), how can a technology platform easily available to everyone provide the competitive edge? The answer lies in the fact that quality is always superior to quantity. One can have the competitive advantage with IoT, or with any other technology for that matter, with an elite workforce. The question now is: how to procure an elite IoT workforce? Learning a cutting-edge technology is tricky and poses challenges. Amidst the constant pressure of quick learning, there is always a dearth of quality study materials available online or in the book stores. Being latest, academic courses do not include these topics in their course curriculum. In such a scenario, the best way to learn an emerging technology like IoT is to opt for online or e-learning courses. Cognixia is an e-learning and digital transformation preceptor with a wide-range of courses on IoT for students, individuals, and corporate workforce. Cognixia strive to offer the best training deliverables with the perfect blend of theory and hands-on training instilling best practices. With industry experts as instructors and state-of-the-art infrastructure, we try our level best to make the whole learning process successful.